This Kerala package is best for the those who want to escape to the land of love. Munnar is a honeymooners paradise and this panoramic hill station commands spectacular views of low-flying clouds and misty valleys. We offer you complete peace of mind as we take care of all the mundane realities of travel, leaving you free to enjoy every moment of your Honeymoon in Kerala. Upon arrival our representative will meet and assist you to transfer to Kochi. Check in to hotel and after some rest proceed for sightseeing on day 01 itself or day 02 morning depends on your time of arrival. Cochin sightseeing which includes Dutch Palace (Closed on every Fridays), Jewish Synagogue (closed on every Fridays and Saturdays), Jews Street, St. Francis church, Chinese fishing net, Visiting the Lulu Mall etc. Day 02: Kochi – Munnar. After enjoying the breakfast proceed to Munnar. Munnar is a land of Misty Mountains and spectacular tea plantations. The best hill station of Kerala. Watch the spectacular beauty of Tea Gardens; enjoy the nature, where the cloud turns into mist, which may touch you with a romantic feeling. Sprawling tea plantations, picture book towns, winding lanes and holiday facilities make this is a popular and most wanted tourist place of Kerala. Day 04: Munnar to Thekkady. After breakfast and check out from the hotel and proceed to Kumarakom. Reach & check-in at the hotel and relax for a while amidst the comforts of your room. Kumarakom is one of the few places in the world where the means for transportation is through boats. Kumarakom is blessed with the Vembanad Lake which has its majestic canals, streams and distributaries along its banks weave an intricate and enchantingly beautiful web. 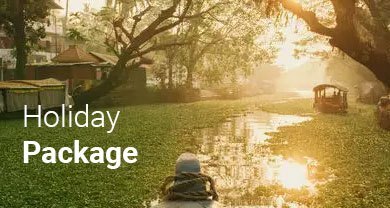 The beauty of nature amidst spectacular mangrove forests, coconut canopies and pulsating paddy fields peppered with enchanting waterways and canals decked with wild lilies, adds to the beauty of its surroundings. Kumarakom is the place for the people looking for a lazy and laid back holiday. 1. The major attraction of Kumarakom is the Bird Sanctuary where a profusion of all kinds of birds can be observed. Domestic birds such as cuckoo, wild duck, egrets, darters, herons, teal, and water fowl can be seen in abundance here, as much as can the Siberian storks which migrate to this area each year. 2. Boating and fishing, very popular with the visitors. 3. An enchanting backwater destination. Day 06: Kumarakom – Alleppey. Begin the exciting journey of backwater cruise with the comforts of houseboat. Houseboats are the modern forms of kettuvallams or rice boats which were used as ferries to carry rice. Lunch on the houseboat and later cruise through the narrow canals of the Vembanad Lake. Explore the serene and scenic backwaters passing through lagoons, canals, lakes, rivers and inlets. See the traditional villages and coconut groves from the deck of the boat. Splash water with your hands and en joy the unique world of water and wonderment. Luxuriant greens, tranquil backwaters, coir-laden houseboats and magical beauty will heal your mind and body as you travel to surreal Kerala backwaters. The boat moors on the lake for the night by evening. After dark you can enjoy a delicious dinner to the sound of water lapping the side of the boat. Day 07: Alleppey – Kovalam. After check out from the houseboat and proceed to Kovalam. After check in to hotel take some rest and leisure at Hotel. In the evening spent some times at the Kovalam Beach. Day 09: Kovalam – Kanyakumari – Kovalam. After enjoying the breakfast proceed to Kanyakumari, on the way visit Suchindram Temple and Padmanabhapuram Palace. After reaching there proceed for sightseeing includes the Vivekananda Rock Memorial , Hindu Goddess Kanyakumari whose temple is situated in the town of it’s, on the sea-shore, and is very confluence of the three water-bodies – the Arabian Sea, the Bay of Bengal and the Indian Ocean. In the evening enjoy the beautiful Sunset and return back to Kovalam. Day 10: Kovalam – Trivandrum/Cochin drop. For all categories AC Innova Car will be used for All sightseeing and transfers as per the package.